Sharon Kleyne Hour - Power of Water ®show of April 11, 2011. Guest: Rebecca Petris, founder of www.DryEyeZone.com. Dry eye disease is a growing worldwide health crisis. Eighty-percent of US eye doctor visits now involve dry eye symptoms. How debilitating can dry eye disease become? Rebecca Petris, founder of www.DryEyeZone.com, has been there. Rebecca Petris developed severe chronic dry eye disease following Lasik surgery in 2001. The resulting severe pain affected every hour of every day and forced her to change careers. In her search for relief, she was appalled by the paucity of information and treatment options (Click for Sharon's 7/20/08 interview with Lasik pioneer Dr. Marguerite McDonald). When Rebecca's search for causes and treatment options hit an impasse, she founded the Dry Eye Zone in 2005 as a forum for others suffering from severe Lasik complications. She soon discovered many desperate severe chronic dry eye patients who never had Lasik, including the. elderly, contact lens wearers, cosmetic eyelid surgery patients and users of the acne drug Accutane. Dry eye is a dehydration disease with multiple and complex causes, both systemic and environmental. Nearly everyone experience mild or transient dry eye and people often ignore or don't notice the symptoms. The Dry Eye Zone cautions that dry eye symptoms should always be taken seriously. Transient symptoms, left untreated, can lead to painful corneal ulceration, visual impairment, other eye dehydration disease such as glaucoma and optic melanoma, and blindness (Click for Sharon's 10/8/07 interview with dry eye expert Dr. Robert Latkany). The most common cause of severe chronic dry eye is a reduction in oil (lipid) production in the eyelids' meibomian glands. This exposes the tear film's water to greatly increased evaporation which is made much worse by dry or polluted environments. Dry eye symptoms include periodically blurred vision, red eyes, grainy eyes, headache and fatigue. Watery eyes are also a common dry eye symptom because tear glands tend to over-compensate for the lack of natural water in the tear film. Rebecca Petris now believes that in most cases, severe chronic dry eye can be managed but the routine needs to be diligently maintained. Ms. Petris found relief in newly developed gas-permeable contact lenses designed to hold in moisture. She also uses frequent wet, warm compresses and "moisture goggles" at night. Sharon and Rebecca discussed the need for eye checkups beginning at birth. The eye, according to Sharon Kleyne, is the only exposed, external portion of the body with no skin. It also directly connected to the brain, which is 80% water. Sharon Kleyne also asked about eyes and nutrition (Click for Sharon's 3/11/11 interview with eyes and nutrition expert Dr. Allen Taylor). The Dry Eye Zone advocates proper diet, which can dramatically reduce dry eye severity. Especially recommended are dark green leafy vegetables such as spinach, arugula, chard and kale. It is also crucial to drink sufficient water - eight to ten glasses a day. Omega-3 fatty acids are also important. A common dietary problem, Sharon and Rebecca agreed, is too much sugar, which is an inflammatory agent. Sugar drinks are a poor replacement for pure water and dry eye symptoms are showing up at an increasingly young age, partly due to poor diet and sugared beverages. Sharon Kleyne and Rebecca Petris discussed formulated eye drops, a common dry eye treatment. Rebecca noted that many patients over-applying eye drops and use them largely as a pain killer. According to Sharon, formulated eye drops can be beneficial in enhancing the tear film's moisture sealing ability but do not add natural water to the tear film. Eye drop therapy is most effective when tear film moisture is supplemented with a natural water mist immediately before applying the drops. Natural water mist therapy, as it happens, is utilized in (and invented by) Nature's Tears EyeMist, sponsor of Sharon Kleyne Hour. This convenient, all-water personal hand-held device emits an ultra-fine, humid mist from which the tear film naturally absorbs supplemental water. 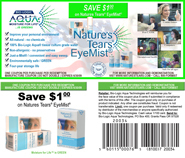 Nature's Tears EyeMist may be safely used as often as needed. Managing dry eye and dehydration diseases. Sharon Kleyne and Rebecca Petris stressed the need to become proactive in seeking education and treatment about severe chronic dry eye disease and other health issues. We should do our own research, discover our own personal needs, feel free to question our health providers and, when necessary, obtain a second or third opinion. Ms. Petris added that "dry eye" is no longer an adequate diagnosis. The doctor should be able to tell you the cause of the dry eye and the condition of your tear film's oil layer.